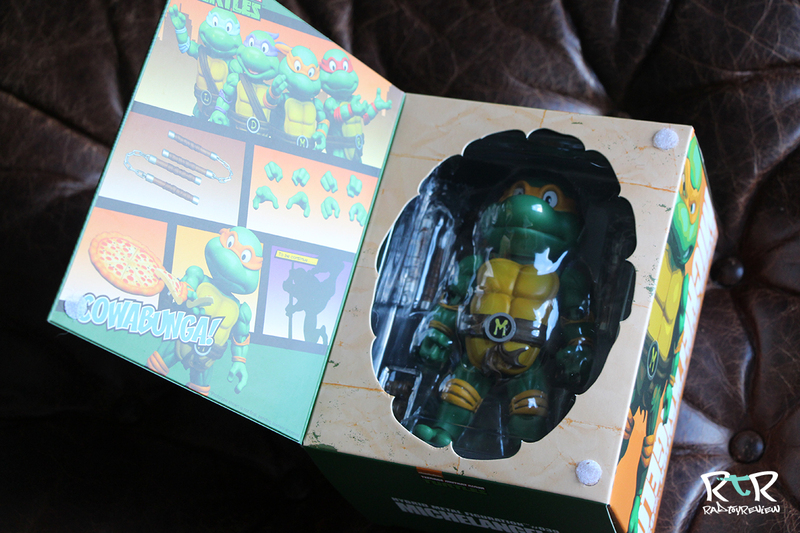 Designed somewhat to resemble the front of a comic book, Mike comes in a brightly colored green and orange (natch) box with a flap front that opens up to a window where you can peak at the legend himself. 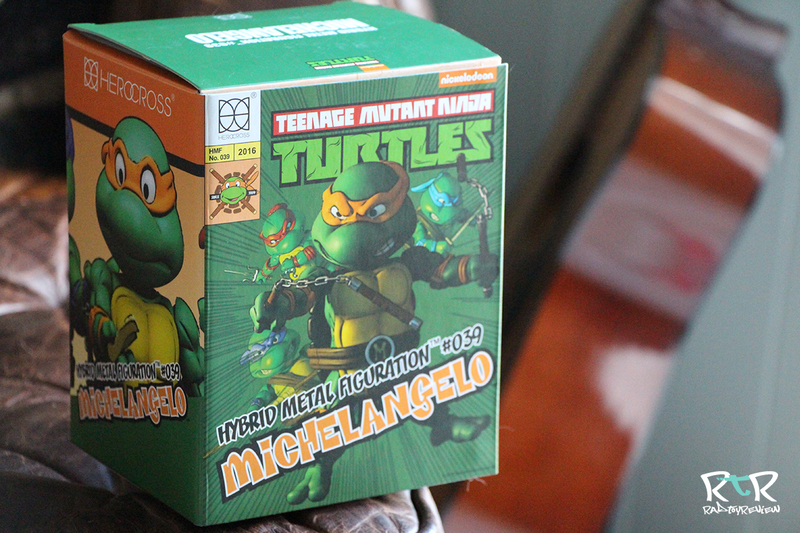 The artwork features a few photoshopped-to-look-like-comics-filtered photos of Michelangelo in various positions on the sides and front, while on the back and inside flap there’s a few clean shots to show off everything you get included inside. You actually get quite a few goodies in the box. 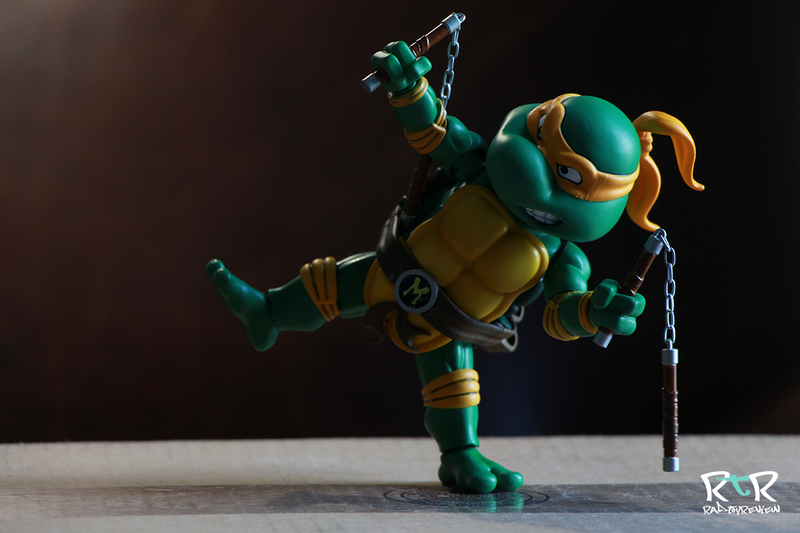 Obviously, Mikey’s there with his default blank stare and a pair of his trusty nunchaku. 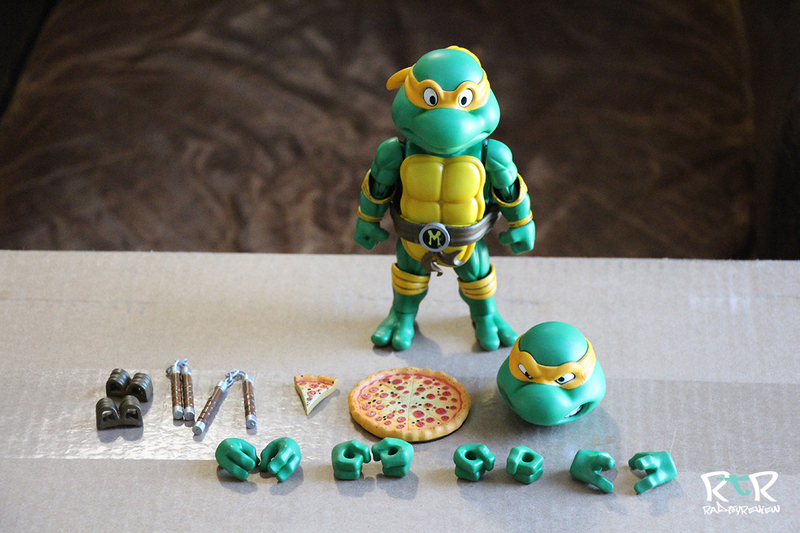 You also get, an extra gritted teeth head, a couple magnetic holsters for his nunchucks, a pizza slice, a pizza pie, and 4 additional sets of hands. 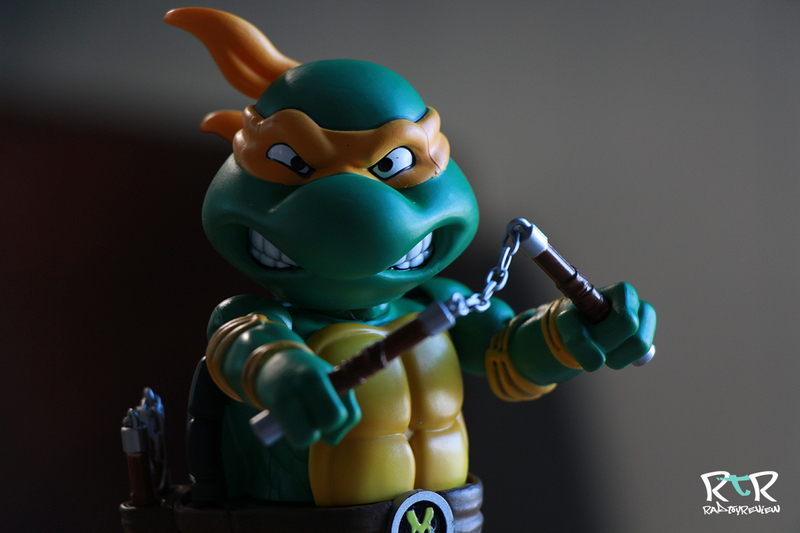 Now of those 4 additional sets of hands, there’s two sets to grip the nunchucks and, if you can see from the pic, they’re almost identical. I’m not sure of the purpose there… but I suppose if you lose one or two of them, you’ll always have backup. 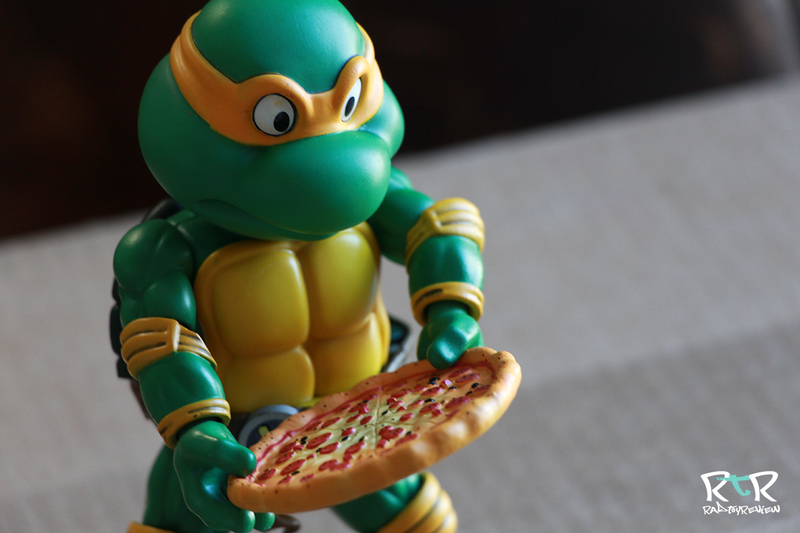 No self respecting turtle would be caught dead without pizza, so it’s pretty cool that HeroCross included not just a whole pie, but a small slice that Mikey can hold in his specifically-sculpted-for-pizza-holding hands. 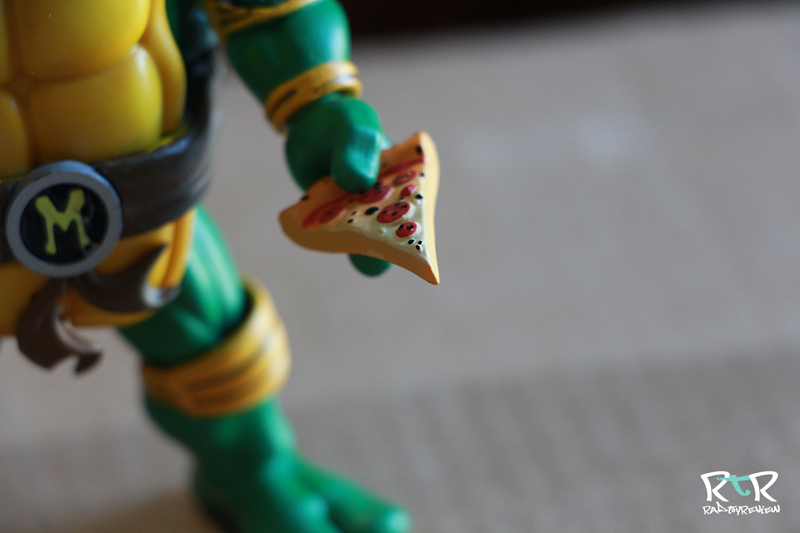 If you want his hands to stay free for pizza smashing, you can store his nunchuks on his back. He’s got two holsters to hold them that snap on easily via some magnets. 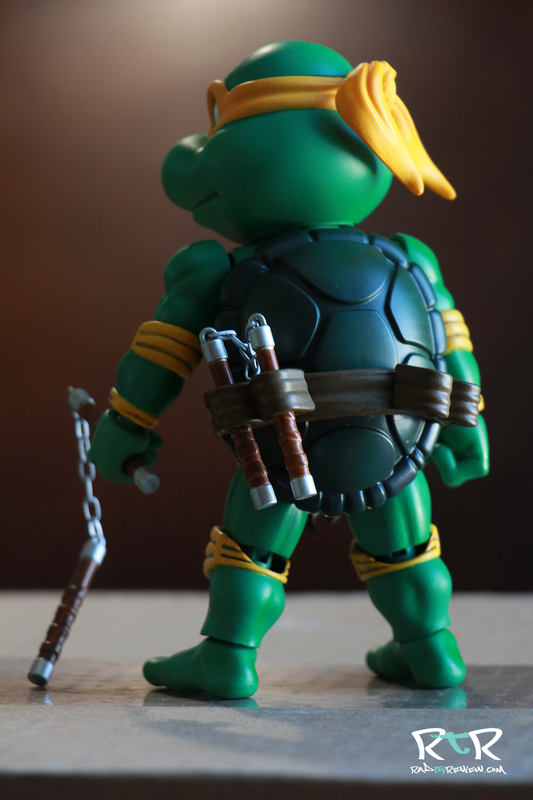 While I like that the holsters are extra pieces that you can use as needed… (if say, you want to display Mikey holding his chucks, there’s no need to have these large empty loops sticking out of back) I wish the magnets were a little more magical.. ahem.. 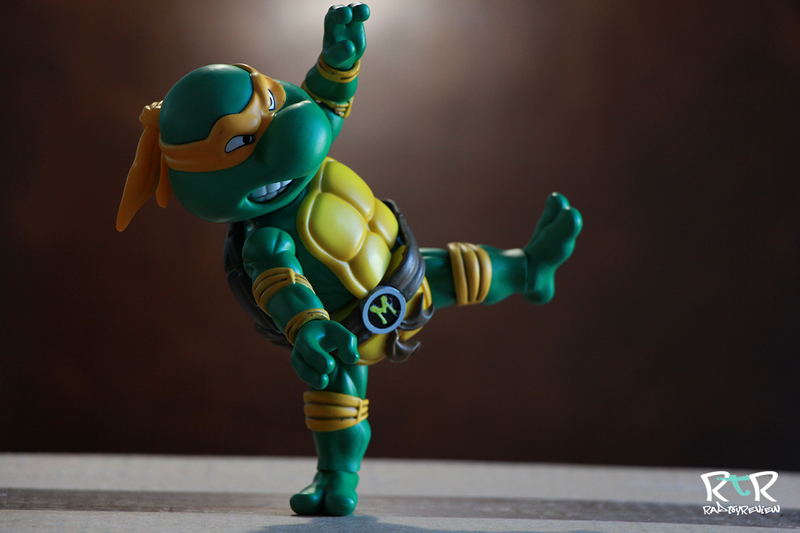 I mean stronger …as they do have a habit of falling off a lot if you get too busy posing him, so keep that in mind. The two head options are fine. 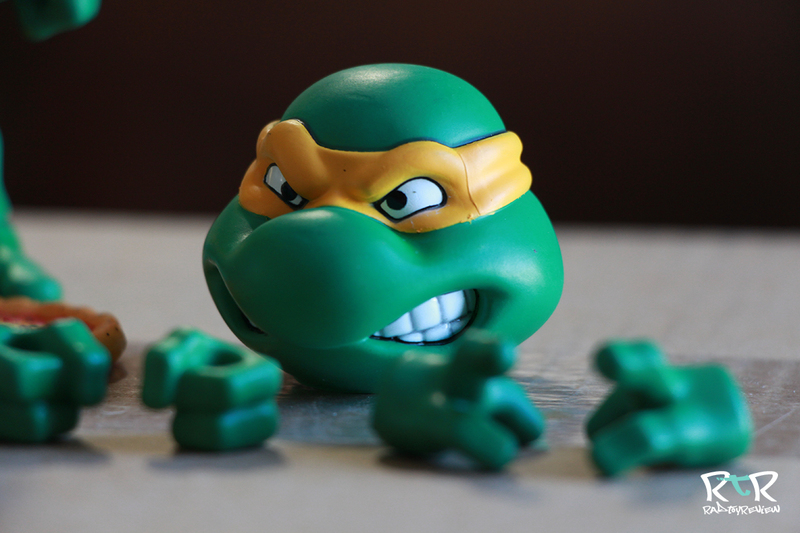 The blank stare can make for some comedic shots, that give Mikey a stunned or contemplative personality… while the gritted teeth is basically the same iconic figure 8 shape lips we’ve been seeing from TMNT since 1984. 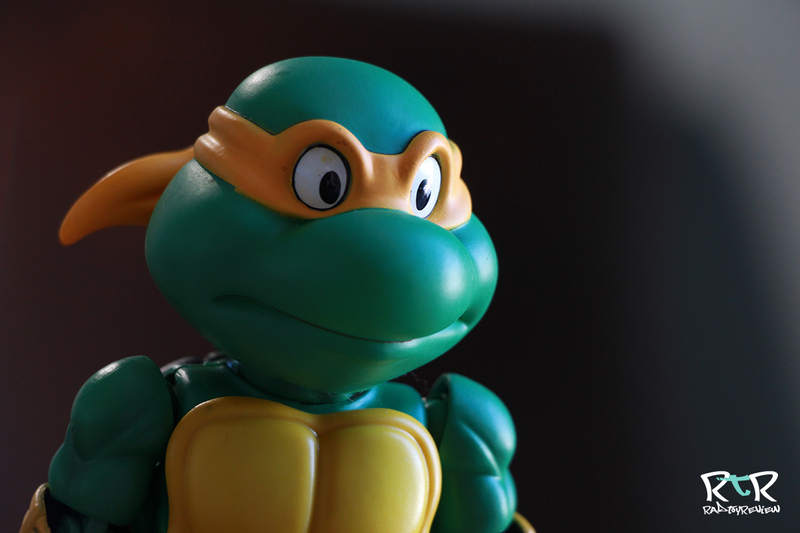 I do wonder why the chose such a chill/neutral expression for Michelangelo when he’s the “party dude”. 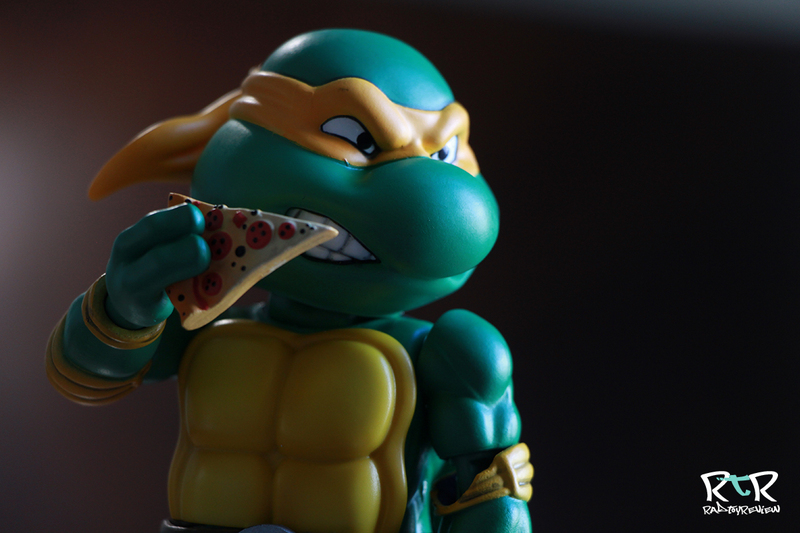 Looking at pictures of the other 3 and it seems like even Raphael is having a better time than Mikey is. Maybe a goofy grin or something with his tongue hanging out would have been more fitting. Anyway, the heads pop off easily with a little force, so at least swapping them back and forth isn’t a huge deal. Now that all the “stuff” is out of the way, what are my first impressions of this guy? 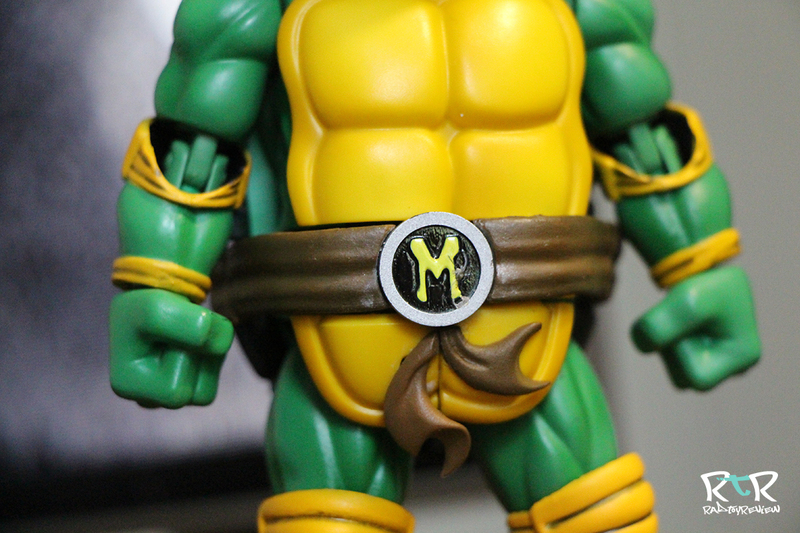 Well, unfortunately, while he’s a pretty fun lil guy to take some shots of, my collectors mentality couldn’t help but notice the many glaring paint issues this particular figure had, the largest of which is right smack on his belt buckle. It’s pretty bad actually. The “M” is scratched with some black marks, the black has some globs of something on it and is missing some paint as well. It’s probably an easy paint fix for anyone with some skills, but it’s a bummer that it’s the first thing I saw when I opened the box. If only that was the only spot. Due to the lighting I was using while taking these shots, I actually didn’t notice this until I looked at the photos later on my computer. If you look closely at his right eye in the image above you can clearly see, the yellow blotches on it. Now I can’t unsee them. After looking the rest of him over, those are probably the two most glaring paint issues, but there’s certainly tiny rubs and spots in several other places as well. It is a little weird that this was the sample I was sent. I am grateful that HeroCross provided this sample for review, but I do find it a little strange that they wouldn’t give him a good once over before sending him my way to make sure something so apparent wasn’t visible. I’d like to claim that you probably won’t have the same issues if you ordered one, but I honestly have no way of knowing that as this is my first time reviewing a Hybrid Metal Figurations. 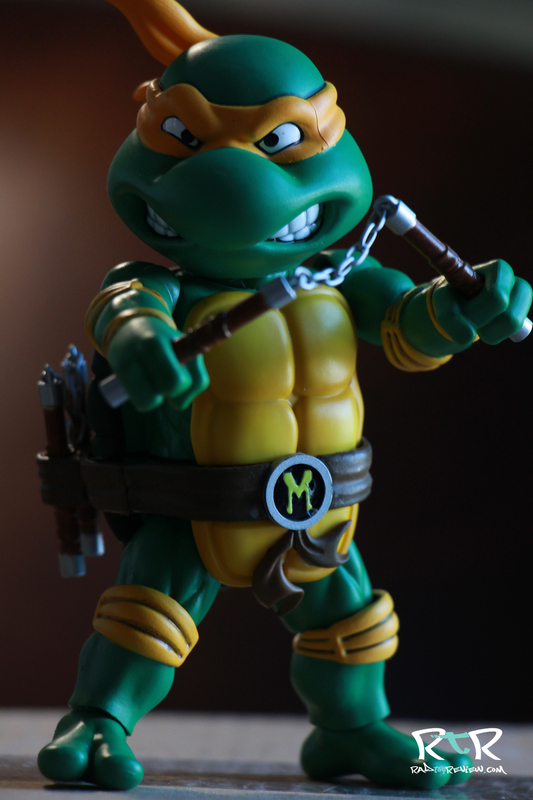 So what about his articulation? Honestly, it’s about what I expected. I can’t say I’m disappointed because I didn’t expect there to be a ton. 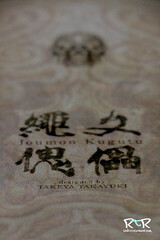 I also can’t say that I’m excited.. because there’s not. As shown below, HeroCross’s whole system is essentially an articulated metal skeleton with sculpted character shell parts over the top of it. In fact, that’s part of where the “Hybrid” element comes in.. the skeleton is made of metal while the sculpted bits are mostly, if not all, plastic. 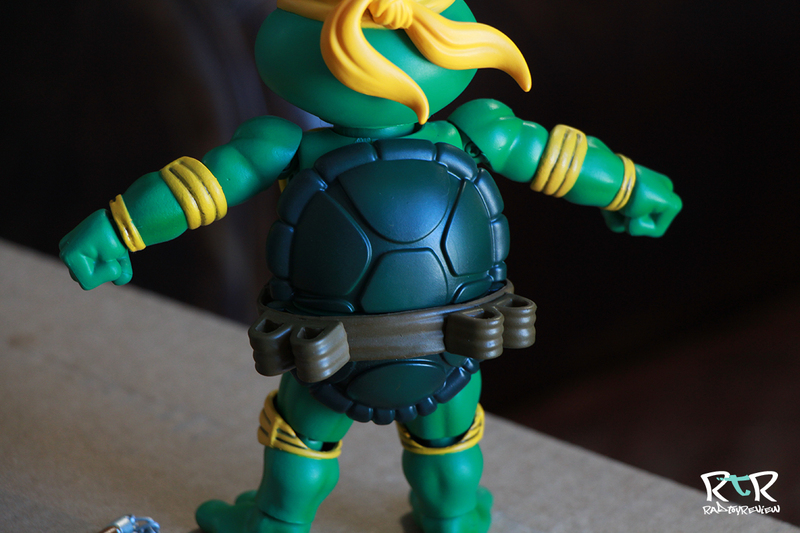 The shell parts certainly hinder just how much his joints move, but what’s there works pretty well. The short list is something like, ball joint/swivel neck, ball joint shoulders, hinge elbows, ball joint wrists, swivel waist, ball joint hips, hinge knees and ball joint ankles. It’s also worth noting that his headband tails can be rotated and adjusted to swoosh the way you prefer. 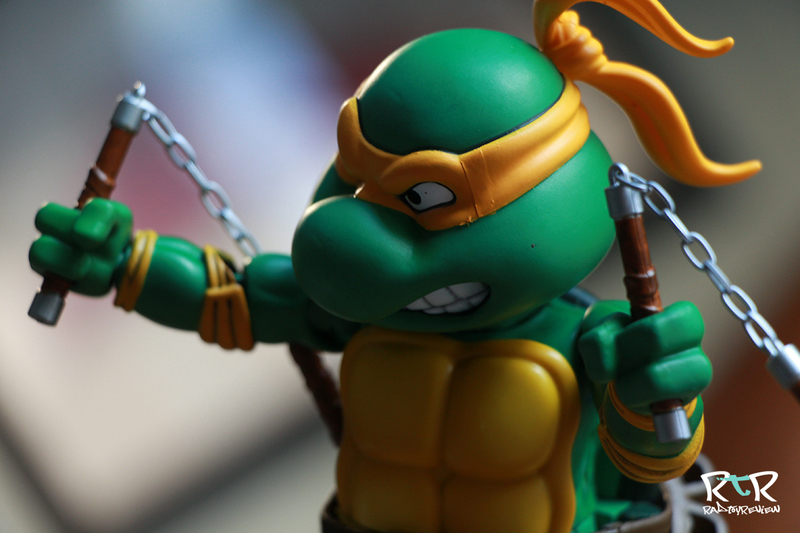 The only real unexpected and annoying issue I had with posing him was the fact that the shells can get twisted and turned around pretty easily. If you’re going for that perfect pose to leave on your shelf the next 6 months, it’ll probably take you a little longer than you’d expect to make sure the biceps, forearms, etc are all facing the correct direction. Also, some of the joints did seem to loosen up a bit while I was posing them, none of them too loose.. but I could see something like the ankles loosening up enough over time to where balancing him one footed up on a high shelf could be a risky venture for our green skinned friend. If it seems like I’m a little disappointed, then that’s probably because I had really high expectations going into this review. Every year, the toys HeroCross display at SDCC are always so fun to look at.. the figures look fantastic. I guess I didn’t expect something as obvious as botched paint to be the thing that got me. All toys have QC issues, some minor, some major. I really don’t consider HeroCross’s paint QC here to be incredibly major but it is enough to throw me off and give me pause. I do acknowledge that this is a $60 toy… not a $200 + toy like something high-end from Hot Toys so an error or two are expected. That said, even at $60, that’s not as mindless a purchase for most folks. It’s not like grabbing a cheap $10 Star Wars figure from the Target checkout line, only to discover it has a bent gun and some jacked up paint when you open it later. You’d probably think, “Oh well, it only cost ten bucks.” Once you hit that >$50 threshold, action figures in general start being held at a much higher standard and collectors tend to be that much less forgiving. 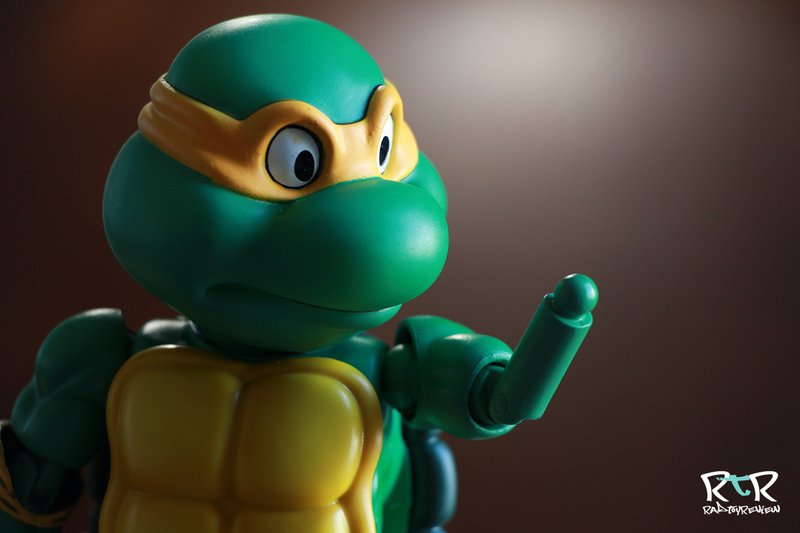 With the paint issues on Mikey as they are, I’m not sure I’ll be ordering any more of this line of turtles for my personal collection… as much as I’d love to have all four. I do hope I’m able to review another HeroCross figure in the future, just so I can get a better sense of the sorta of QC one should be able to expect from them. Perhaps something that can stand alone, like Batman or Predator. 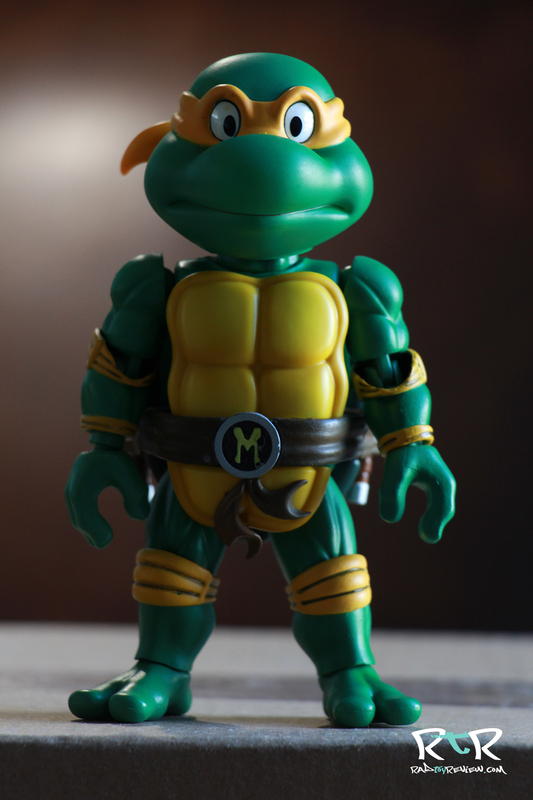 Honestly, If the paint issues were not there, I’d be really happy with Mike. I may not generally go after this style of action figure over more realistic and fully articulated ones, but I do enjoy the variety and bright, cartoony look of the figure. 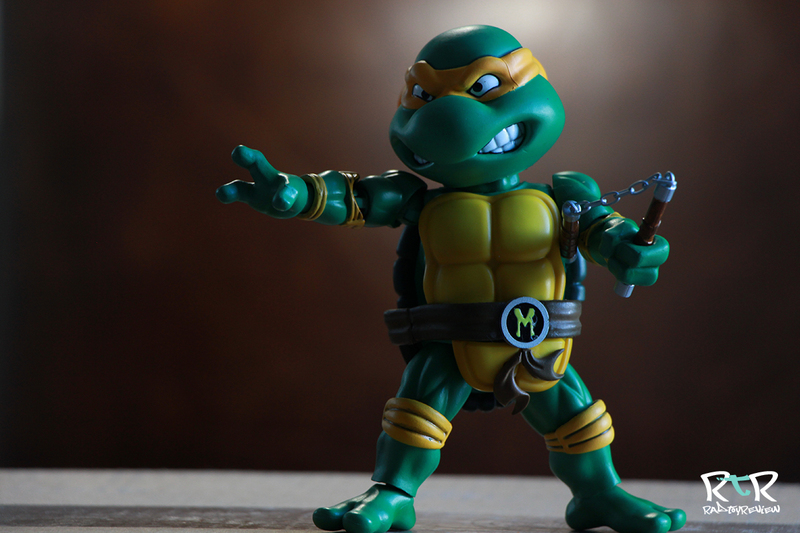 Mikey feels solid and well made, he’s fun to pose and I had a great time playing around with him while taking these shots. 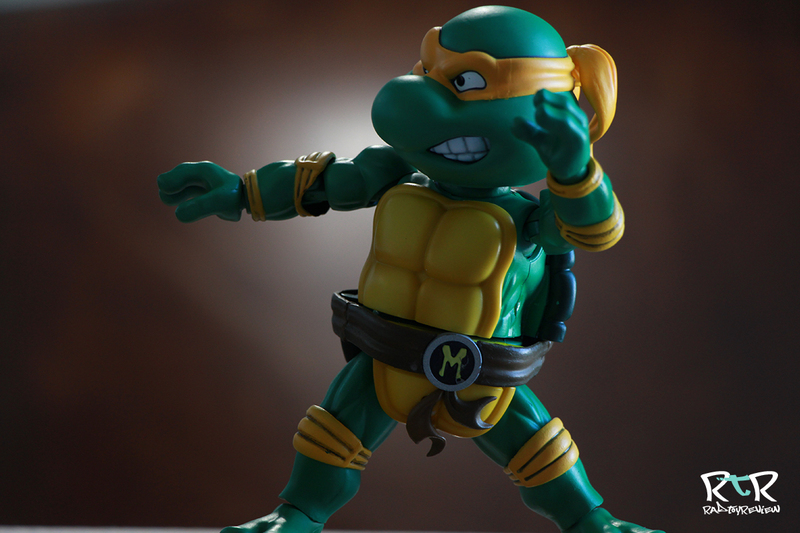 For people who are big TMNT fans, you can certainly do a lot worse than the ones from HeroCross. I just hope the paint issues I saw are a rare occurrence. Maybe check the net for a few more reviews and see if you see a repeat of the issue… if not, consider it my bad luck and order away! 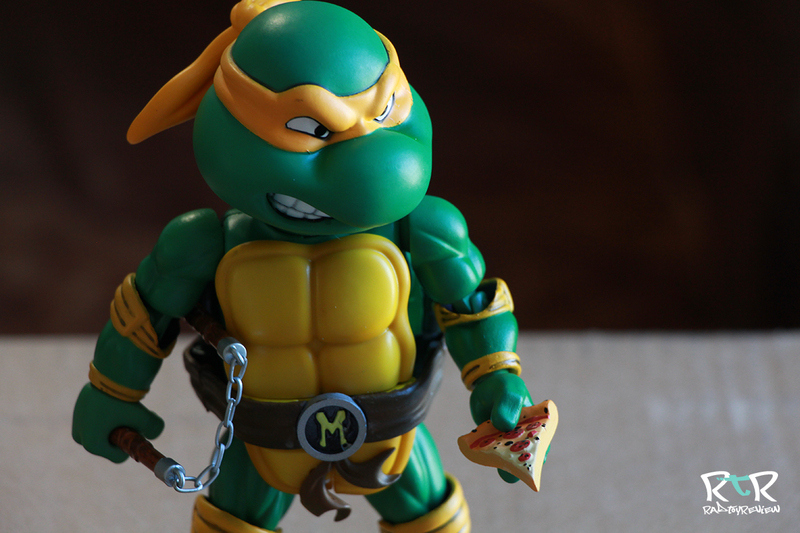 A big thinks to Ken and the HeroCross team for sending us Michelangelo to review! Please follow them on their Facebook Page or check out their awesome YouTube channel to see more of what they have to offer! 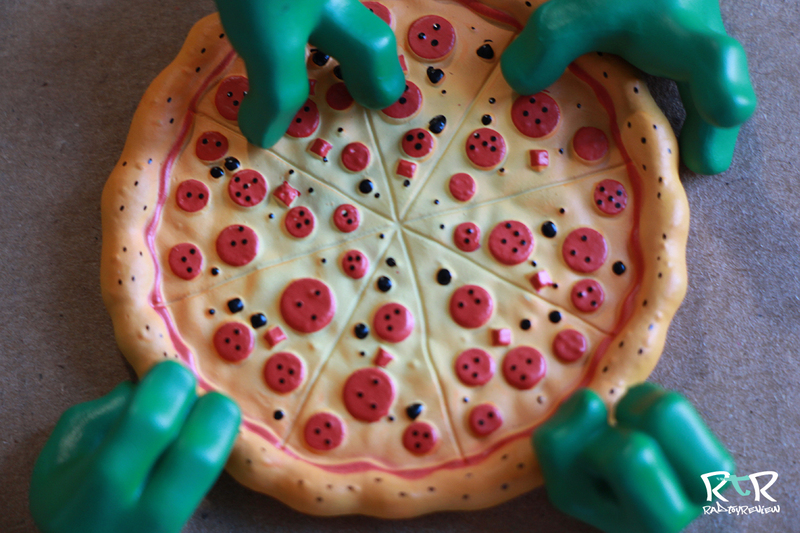 As always, thanks to you, our readers, for continuing to support Rad Toy Review! 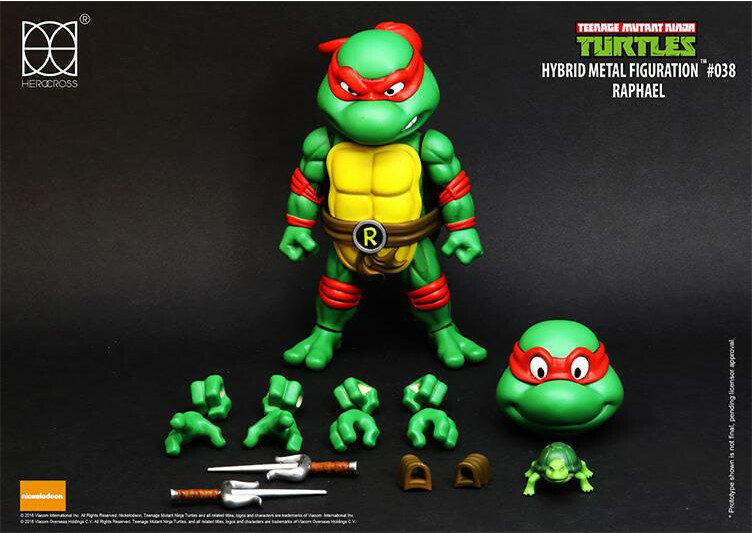 If you’re havn’t already, follow us on Instagram, Facebook, YouTube and Twitter for all the latest toy reviews from Rad Toy Review!